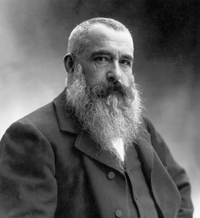 About the artist: Claude Monet (1840 – 1926) was a French painter, a founder of French Impressionist painting and one of the most consistent and well-known practitioners of the movement’s philosophy of expressing one’s perceptions before nature, especially as applied to plein air landscape painting. Monet’s love of the French countryside inspired him to begin painting. His technique involved replicating the same scene many times in order to achieve the end result. He was more interested in capturing the changing of light and the passing of the seasons than the finer, physical details of a landscape. From 1883, he lived in Giverny, where he purchased a house and property and began a vast landscaping project. His garden was made up of several large lily ponds, which would become the subjects of his best-known works. In 1899, he began painting the water lilies, first in vertical views with a Japanese bridge as a central feature and later in the series of large-scale paintings that was to occupy him for the next 20 years of his life. Monet died of lung cancer in 1926 at the age of 86, and is buried in the Giverny church cemetery. At his funeral, his long-time friend Georges Clemenceau removed the black cloth draped over the coffin, stating, ‘No black for Monet!’ and replaced it with an appropriately flower-patterned cloth.